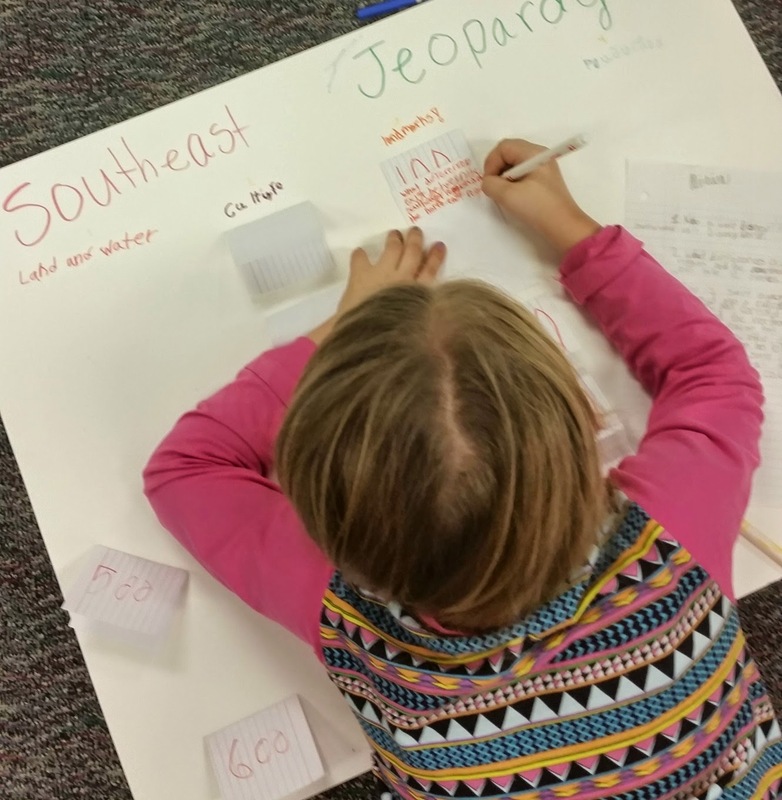 Our school district studies the regions of the United States as part of our social studies curriculum. It takes us all year to study the ins and outs to each of the six regions. Since this is obviously broken up into six different units, I try to get creative on how students can show me that they understand that particular region (in addition to a test). If you couldn’t tell by the picture, I opted for the famous Jeopardy review! In past units I have had students create scrapbooks, dioramas, and PowerPoints to explain the features for that particular region. 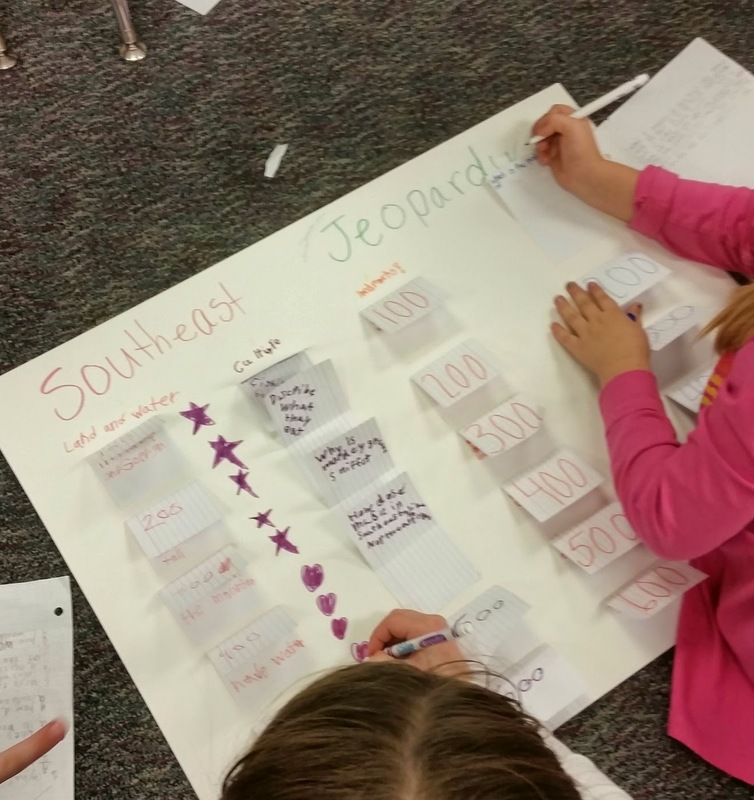 This time around, I decided to have them create Jeopardy review posters using Bloom’s Taxonomy. For each region, students are expected to know about the geography, history, culture, landmarks, and economy (for this particular activity, we studied the history of the region separately). After studying the southeast region for a while, I decided it was time to create our project. I first broke students up into six groups of four. In those groups, each student was assigned a particular feature (geography, landmarks, culture, and products & natural resources). Then using the Jigsaw method, I had all the ones (geography feature) from each group get together, all the twos (landmarks) get together, and so on with the threes (culture) and fours (products and natural resources). Together in their new, homogeneous groups they read about their particular feature (I used Jill Russ’s Nonfiction Articles found here on TpT). After reading about their particular feature together, I then gave them a copy of a Bloom’s Taxonomy paper I found on the web (source here) with sentence stems. I explained to them that teachers have to ask different types of questions in the classroom in order to get students to think deeper. Then I explained the chart, how to use the sentence stems, and modeled creating an example question from each level (my example was using our science topics of force and motion and not social studies). The students worked together in their groups creating one question from each Bloom’s Taxonomy level about their feature. 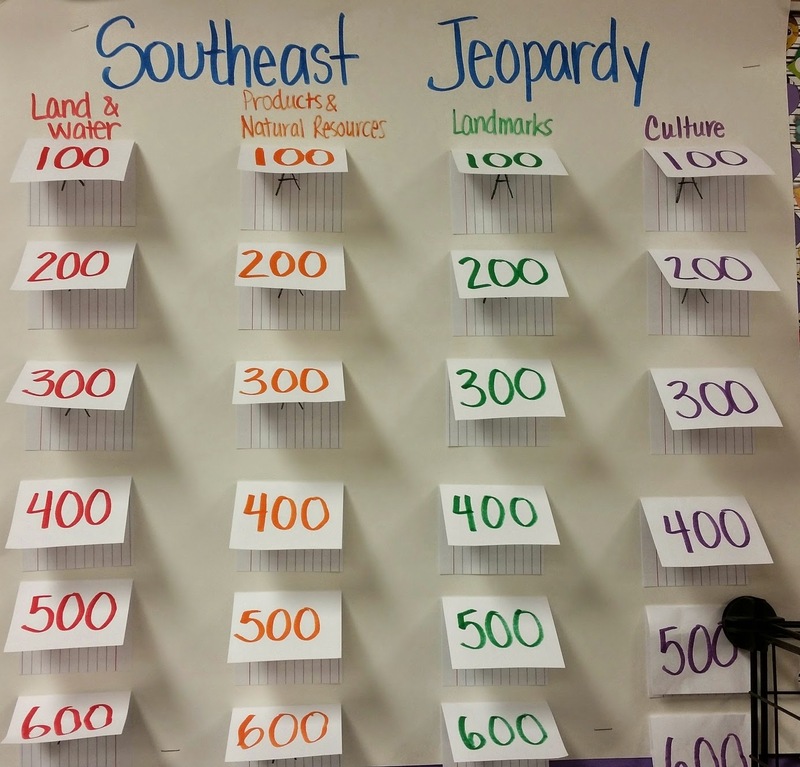 For example, for the knowledge level a student may ask, “What famous mountains are found in the Southeast Region?” Not only did they have to create a set of questions together for the Jeopardy review, but they also had to provide answers too! As I circulated to assist, I found that often students struggled with those higher level questions but it also encouraged a lot of discussion and deeper thinking! After creating a question for each of the Bloom’s Taxonomy levels for their particular feature, the students then moved into their first group that I had created (where they had one person from each feature) and began creating their Jeopardy review boards. I explained that the “create” level questions were going to be worth more (600) while the “knowledge” level questions were less (100). I provided students with six index cards each. After folding it, they placed the question and answer on it along with the amount the question was worth. Then we glued them down in arrays and decorated our boards. I enriched some of my higher kids by encouraging them to rephrase the questions and answers similar to the show Jeopardy. While the boards aren’t the most glamorous, the kiddos really enjoyed this activity and I got to hear some really great things! Happy Teaching! Let me know below how your students liked it! This is great! I am totally trying this out with my 4th grade when we study regions next fall. So glad I found you through the TPT forum. I'm your newest follower!